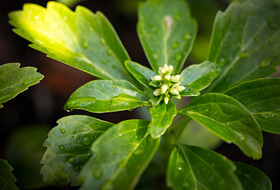 The core element of the "Sedum Carpet" system build-up are the drainage and water storage elements Floradrain® FD 25-E, that are subsequently covered with the Filter Sheet SF. The private dwelling house, Gleneagles Drive Residence with its spectacular views of the Pacific Ocean is in one of the most sought after neighbourhoods of West Vancouver. 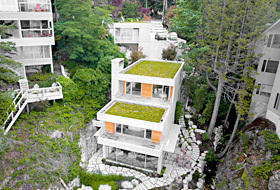 The flat-roof building on a hillside location, comprising a number of individual components, has an extensive green roof area totalling approx. 180 m² and presents itself as being just as cultivated and elegant as the sophisticated neighbourhood in which it is situated. 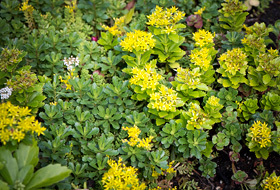 ZinCo Canada Inc. supplied the suitable system build-up “Sedum Carpet” – simple and flowering. The district of West Vancouver is to the north-west of Vancouver in a superb scenic location, stretching from the southern slopes of the North Shore Mountains to the shores of the Pacific Ocean. Due to its incomparable location between sea and mountains, Vancouver is considered to be one of the most beautiful cities in the world, offering a unique combination of civic amenities, cultural attractions and nature. The population of Greater Vancouver is over 2.4 million, about half of the entire population of British Columbia, making Vancouver the largest metropolitan area in Western Canada. In Western Canada, ZinCo Canada Inc. collaborates with the experienced distributors, Architek SBP Inc. Architek had already begun to collaborate with the owners Les and Leslie Allen and with the architect commissioned by the Allens, D.B. Simpson, during the planning phase. 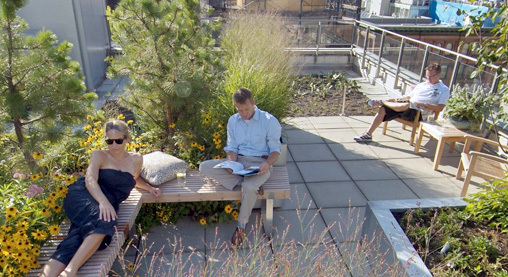 The owners were also very active during the construction phase of the green roof installation, which Architek carried out together with a qualified landscape gardener. The three individual roof areas to be greened, approx. 180 m² in total, are all at different altitudes, and in addition, the hillside location of the property provided for somewhat difficult access conditions. 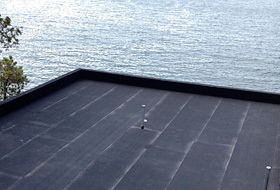 The roof areas themselves have pitches of between 1° and 7°. 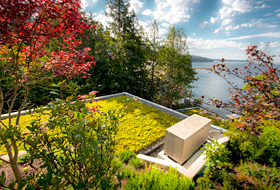 The foundation of the green roof consists of a reinforced concrete roof with a rigid foam insulation layer onto which a bituminous root-resistant waterproofing membrane was installed. 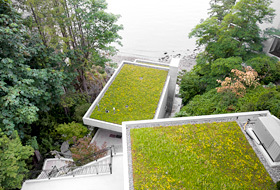 The green roof build-up itself was then installed, starting with the Protection Mat SSM 45. The next layer was the drainage and water storage element Floradrain® FD 25-E, which is the core piece of the system build-up and reliably regulates the water balance: the 25 mm high elements store water in their water storage cells and safely draw off the surplus water through the underlying channel system. This layer was then covered by the Filter Sheet SF and the green roof build-up was ready for the substrate. 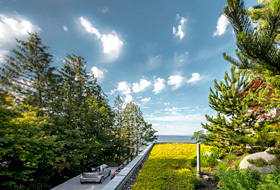 The combination of mineral and organic elements that make up the system substrate used here, “Sedum Carpet” (referred to as “Zincoblend-E” in Canada), is perfectly adapted to suit the plants that were used. The substrate was delivered in so-called super bags and was spread across the roof areas to a depth of approx. 10 cm. 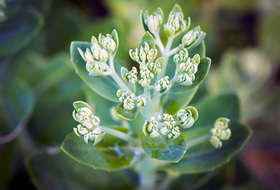 The plant layer consists of pre-cultivated sedum mats that contain a variety of low-growing sedum species such as White stonecrop (Sedum album), Little evergreen stonecrop (Sedum hybridum “evergreen”) or Japanese spurge (Pachysandra terminalis). 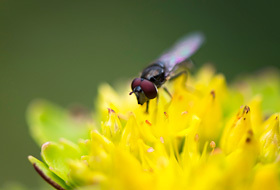 Yellow is the predominant flower colour, which gives the roof a simple and clear appearance. The harmonious, functional layers of this proven ZinCo system build-up will ensure that the plant growth will be established permanently. 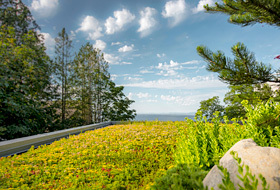 An extensive green roof with self-maintaining sedum species is by nature very low-maintenance. A landscape gardener has been tasked with the care and maintenance of the new green roofs at Gleneagles Drive Residence where he will remove any weeds, if necessary, and will check the roof drains once a year. Individual anchor devices are installed on the roofs and the gardener can attach himself to them and use them as a fall arrest system. 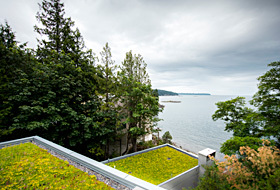 Due to the steep coastal location, the uppermost green roof area on the North side merges directly into the natural landscape that is at the same level. This part of the building is used as a garage and is accessible from the side from a driveway that slopes down from the road. Part of this 170 m² driveway area with additional car spaces is also the roof of a building. Architek SBP Inc. incorporated strips of EcoGreen into the driveway in order to reduce drainage. 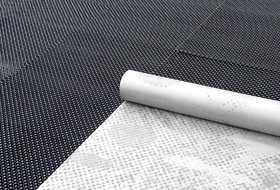 A ZinCo EcoGreen is a grid element made of recycled PE-LD that is filled with substrate and with pre-cultivated lawn, ideal for use on access roads and parking areas. This allows for a very neat, overall appearance. When you consider the challenging geographical location of the property and the steep coastal landscape with its rich tree population and rocky underground, the owners and planners have achieved something very special here. The individual areas comprising the garden, the living space and the parking space nestle together to create a superb architectural structure. Man takes ownership of the steep coastal location but retains that balance between nature and architecture.